This weekend, on the nineteenth of March to be exact, Ro reached that most important milestone that divides infants from toddlers. Hoo boy, were we ever excited! “I did it! I did it!” she said, as I cheered wildly. Then she did it again! And again! So far it’s only the little bitty step or two, then the excitement of new-found mobility knocks her right over and she’s done for a while. . .
It’s with a bittersweet mix of excitement and nostalgia that I recognize the fact that my littlest baby is well on her way to the land of bigger girls, and within a month or two will be running around with the rest. 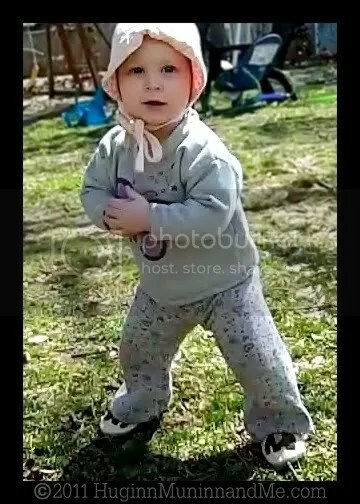 So now, for the first time in the history of Huginn, Muninn, and Me, allow me to present you with this 10-second video clip capturing one of Ro’s first steps. If you listen carefully through my very loud and obnoxious screaming, you can hear Ro saying “I did it!” She’s so proud of herself! And yes. That IS a bonnet on her head. An actual honest-to-God baby bonnet. *EDIT* One week later, she was taking as many as 13 steps in a row. By March 30th, walking is swiftly becoming her primary mode of transportation. Though it’s still a bit of a zombie walk at this point, this kid isn’t wasting any time becoming a true toddler!